Union County Fair Parade - Monday, July 25, 4:15pm. We will once again start off our performance season at the Union County Fair parade on Monday, July 25th. Band members need to meet on the South lawn of the Union County Court House, at the corner of 6th and Court streets in Marysville at 4:15pm. Dress is summer uniform, including your official red band polo, all-black shorts, white socks, and white-ish athletic shoes. Music for the parade is "The Victors" which is to be memorized. The parade will commence at 5pm and proceed to the old Marysville Middle school where the parade will end. Band members will receive free entry to the fair after the parade. Please arrange to be picked up at the end of the parade, as transportation back to the site of the parade start is not provided. Was really impressed yesterday with what the band is sounding like. Love the Pirates!!! Please make sure you check the blog frequently. Band polos will be delivered on Monday at the fair lineup. Still looking for a 2-9 on Tuesday and Wednesday 2-6. Please consider helping us out, even if it is only 2 hours I will work with you. We have a committment that needs to be filled. We are in a different dorm this year at FMB camp. Hayes Hall is being renovated so we will be staying in Welch Hall. Directions to the Welch Hall parking lot are below. The layout of the dorm is exactly the same as Hayes but with a much updated common room area. It is also closer to our practice field and equidistant from the dining hall. If you get lost on your way to camp, please call my cell for rescue! Click the map to enlarge then type in your address for detailed driving directions. Let me know what you think. Feedback welcome. I need to finalize the design by Thursday afternoon. Click the image to enlarge. Greetings all... need to give an update on band. 1. We are getting ready to order the tshirts for this years band...If any adults would like a shirt I need to have the size by noon on Thursday, July 21. Please either email or text me size at 614-306-4307. Please add your name to the text so I know who to go to . Price is $10.00 if you want 2x or larger we need to add $2.00 per size enlarged. Make checks or money orders out to FMB. 2. Tomorrow morning I will be at the school to make some announcements to the children about band camp and answer any questions they might have. I will also be giving them an invoice with the amount still owed on their band camp fees. Please make sure you ask your child(ren) about them when they get home. All fees must be paid by band camp check-in. Please only bring check or money orders. Cash is not accepted on payments. This is for accounting purposes for both you and the boosters. I have almost all of the music for the upcoming season available for download. 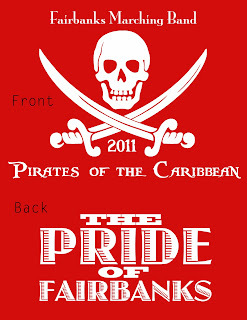 Part I of our "Pirates" show was backordered until this week and will be available next week at rehearsal. Click the link to download your entire folder, including pre-game, cheers, and contest music. Rookie Camp - Monday, July 18, 8am-noon. *You need to get to OWU around noon on July 31. Lunch is not provided so I would grab something before you arrive. I'll get your key and you can move your stuff into your room. Directions to Hayes Hall are on the band camp page. If you get lost, or need more info, call me at my cell at 937-243-2031. Please feel free to use this number anytime you need. *After you get moved in, we'll need to dot the field and put up the scaffolding. Immediately after, we'll have a staff meeting and get ready for campers to move in from 3-5. Greetings and hope everyone is enjoying their summer vacation from school! Needed to get information out to all band parents. Still waiting on Mr. Keller to get me the email addresses of all the new band members. Please if you know of any or have any email addresses to forward this information on to them...PLEASE DO SO! We need as much as help as possible and unfortunately time is short. We have already signed up to work the fair gates at the Union County Fair on Wednesday, July 27th..we still need some volunteers...the bigger issue is, yesterday, I was contacted by the Union County Fair Board to take on Tuesday as well. We need as many parents and members over the age of 15 to help out. Please email or call me at614-306-4307if you can help out.